Due to work commitments my fishing has been limited to the odd day session here and there. I have decided to fish the farm pond whenever I can (see my post about small water carping for more information http://iansfishing.co.uk/carp/small-water-carping/). To make things a little more fun I have decided to use a centrepin coupled with a wagler float rather than the normal bolt rigs etc. I have gone with a simple set up, but it is effective and works a treat, and let me tell you catching carp on it is just so much fun. My set up consists of a Greys Prodigy 1.5 test curve Avon rod, a centrepin reel loaded with 12lb Korda subline, a 1.75g puddle chucker float locked in place with 2 float stops, a size 8 swivel covered with a buffer bead. The tag end is passed back through the bead and 2 bb shot are pinched onto the tag end. Attached to the swivel is an 8lb hook length with a size 10 hook. I like to use a puddle chucker float because you can hook the float on and off the line without having to use clips etc. It was quite easy to find the fish as the water had dropped to about half a foot meaning that there was an average depth of around one and a half feet. They were feeding confidently on a spot I had been pre-baiting with hemp and maize for a couple of days. I thought the best way to approach the day would be to use 3 maggots on the hook, a mixture of reds and whites (red, white, red, my lucky combination) whilst constantly feeding a pinch of maggots every minute or so, after a fish was landed I would top up the swim with a handful of hemp, maize and maggots whilst the fish was still in the landing net. It seems that on this occasion I got things right as I caught steadily through the day and ended up with 7 fish between 5 and 12lbs. 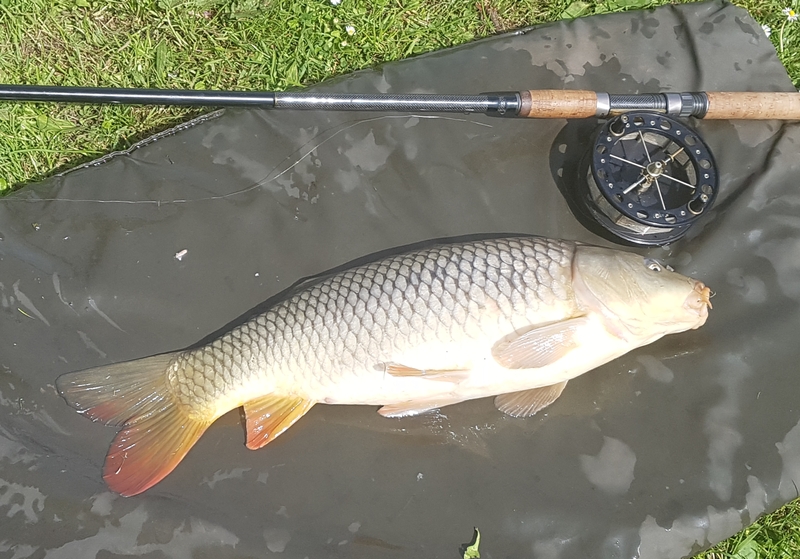 Nothing massive but all gave good accounts of themselves on light gear and shallow water, I really had forgotten how much fun it is to catch carp on such light gear and just how effective the methods that I first used as a kid are today. Ok so the centrepin is a bit of a change to what I first started out with but everything else is pretty much unchanged. 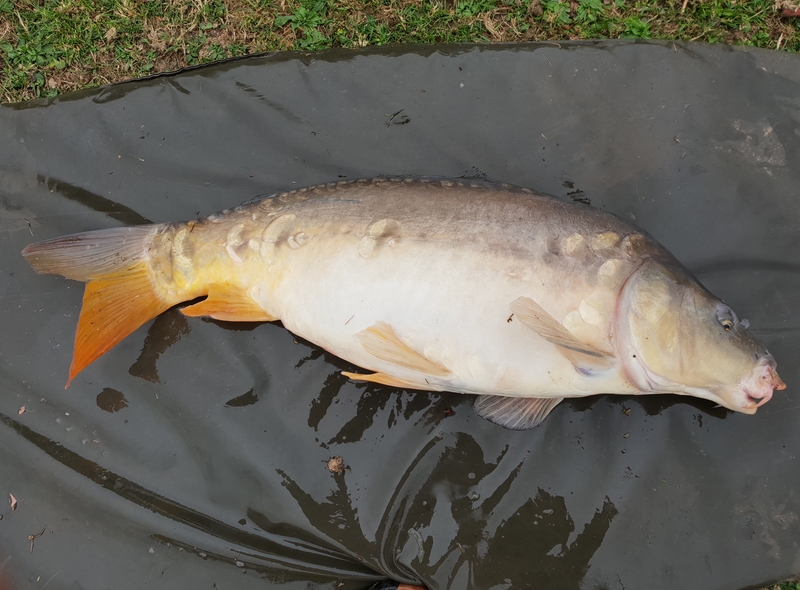 This entry was posted in carp, fishing, tackle, tips, tips and tactics and tagged Bait-Tech, carp, carp fishing, fishing.